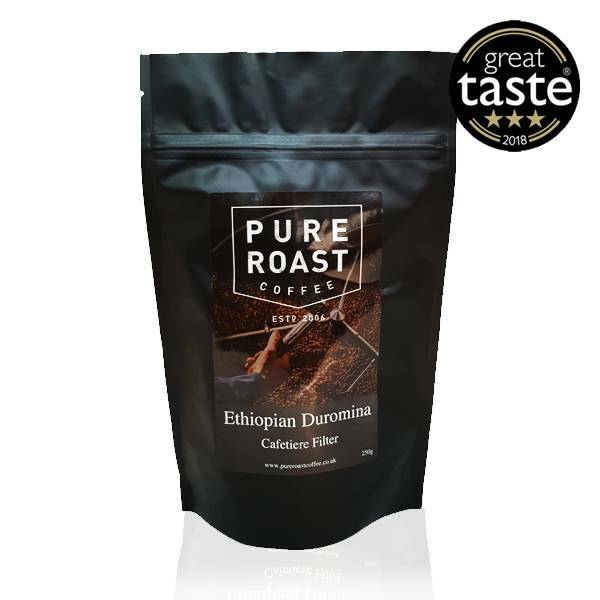 Ethiopian Duromina Single Origin Arabica Coffee. This heirloom variety from the Jimma Zone in Western Ethiopia really impressed at the 2018 Great Taste Awards, receiving a coveted 3 Star Award. Wonderful bright orangey notes to this coffee with a bright Earl Grey bergamot heavy back bone. Very clean. An extraordinary example of huge aroma on a ground coffee. This is a wonderful example of terroir and it really does what it says on the description. Really clear notes of bergamot and almond. An intense and complex coffee. An extraordinary fruity coffee, packed with light apricot, lychee and possibly almond notes. No bergamot for us, but a delightful lightness on the palate, with a total absence of bitterness, leaving a lingering fruitiness as a final note. A sympathetically treated coffee.